Kitchen tile backsplash installed In Lincoln home. 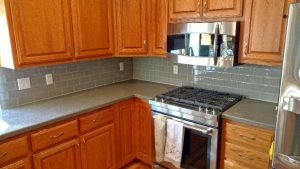 Kitchen tile backsplash is one of the most important upgrades to your kitchen as the design of your kitchen counts on the backsplash to add the needed touch. The owners of this newly designed kitchen wanted a subway tile backsplash to complete the design. Subway glass tiles are a great choice for your kitchen backsplash. They are family-friendly because they resist stains and are easy to clean. They are also great if you are working on a tight budget. 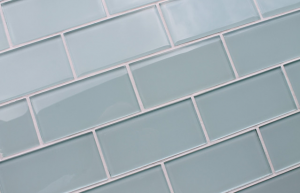 The subway glass tiles can range anywhere from $2 per sq. ft., and up to $5 – $7 per sq. ft. for the thicker tiles. At Lincoln Custom Masonry, we can give you an array of choices for your backsplash. From tile to brick and flagstone. Also, be sure to ask about the grout colors as they come in an array of colors. We chose white with these gray Subway tiles to help the backsplash stand out and have a little pop. We’ll help you design your kitchen backsplash from a rustic look to a sleek style, depending on your budget and needs, and then install the backsplash of your choice.